Home » Theater Reviews » Pound (Ezra Pound) – Outstanding! 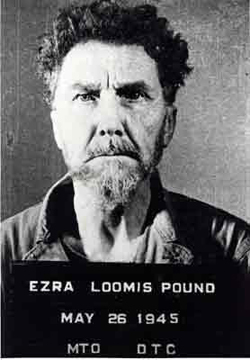 Pound (Ezra Pound) – Outstanding! This is a play about the power of words, about a prominent person’s words granting permission for (abhorrent) behavior, and about culpability. Sound relevant, timely? The piece is riveting, acting and direction superb. During World War II, iconic poet/critic Ezra Pound recorded over 200 virulent, Anti-Semitic broadcasts against the United States and in support of Italy’s fascist government. He was charged with treason but never stood trial. Instead, found mentally unfit to aid in his own defense, the author was confined to St. Elizabeth’s psychiatric hospital for 12 years, erratically ruling the roost. Pound midwifed the work of T. S. Eliot, James Joyce, Robert Frost, Ernest Hemingway… as well as helming a series of important literary magazines. He lead and perhaps created a modern poetry movement called imagism. A group of these writers, lead by Archibald MacLeash, eventually got him released. “Even Tokyo Rose only got 6 years,” protests the fictional character. Pound left a changed and broken man. Sean O’Leary’s terrific play conjectures his time towards the end of incarceration. It’s helpful to know some facts predating what we observe onstage: Before transfer to St. Elizabeth’s, Pound was imprisoned at the United States Army Disciplinary Training Center north of Pisa where he spent 3 weeks in a 6×6 foot outdoor steel cage with concrete floor, lit up at night by floodlights. When finally examined, he was found –big surprise- highly unstable. Transition was at first not much better. The literary giant was held in a windowless, steel-doored prison ward with peepholes and limited visitation until, rather than allowing a bail hearing, the institution’s administrator moved him to the more pleasant Chestnut Ward. What thou lovest well is thy true heritage. What thou lov’st well shall not be reft from thee… (Canto LXXXI) rises from the dark theater in Ezra Pound’s craggy, phlegm-filled voice. If you’ve ever seen a Pound Canto zigzag across paper, you’d be surprised at the clarity of recitation. Archibald MacLeash (Redman Maxfield) sets the scene and withdraws. Ezra Pound (Christopher Lloyd) enters looking like an absent-minded college professor with young, officious Ann Polley at his heels. (Kate Abbruzzese) She’s to be his psychiatrist while Dr. X is on sabbatical. He takes her for part of a prank. “Didn’t they tell you I’m beyond help?” Ann questions Pound’s longtime nurse, Priscomb aka “Blue Hair” (Cynthia Darlow) who protests she hardly knows him – not true. In a series of formal sessions and interim encounters framed by the dimming and brightening of lights, we watch Pound and Ann literally and figuratively circle one another. We’re privy to moments with the alternately proper and nurturing “blue hair.” After 12 years, unspoken affection is palpable. Only Nurse Priscomb sees what the writer’s new sessions are doing to him. And parentheses where MacLeash organically adds exposition. It’s interesting to note that his constant theme was the reconciliation of idealism and reality. Sean O’Leary has written an extraordinary play. In the space of 90 minutes, Pound’s changes are so gradual, we believe months are passing. He exasperates, manipulates, bullies and cajoles. To see the man finally affected is quite startling. Ann’s approach carefully measures momentum-until she pulls the breaks revealing an enormously pivotal secret. Ideas are well articulated as defined by character. We delve into mind and soul, the human condition. Director Kathleen Butler shows enormous finesse and superb character comprehension. Physical staging is fluid, varied, credible. Pacing is perfect. Not a word is uttered without roots. The cast is excellent. Redman Maxfield gives us a calm, personable MacLeash with just a bit of twinkle in his accepting eye. Cynthia Darrow’s Nurse Priscomb wears the habitual stiffness of efficiency in tandem with barely hidden protective tendencies. As Ann, Kate Abbruzzese wisely starts under the radar, mounting a clarion campaign for which only she knows the motivation. 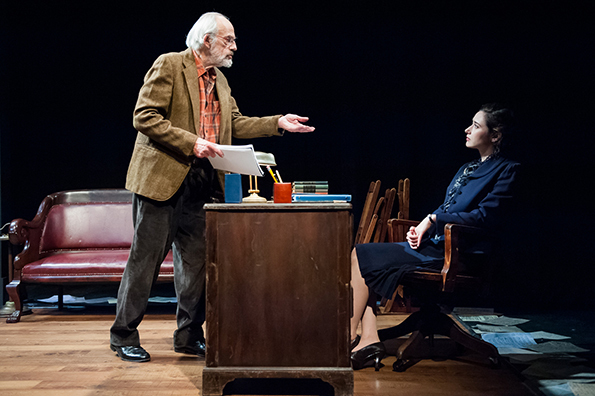 Christopher Lloyd, who began his career in theater, offers a powerful, nuanced portrayal of a larger than life intellect without going over the top. From pixilation to agony, every action and emotion read real and of a piece. Matthew Buttry’s Set provides just enough atmosphere. Izzy Fields Costumes are excellent.